I used to run, and I loved it. Pres loved our jogging stroller and I'd smile as her little hand would stick out the side signing the different animals we passed. After we lost her, I went running and hated it. 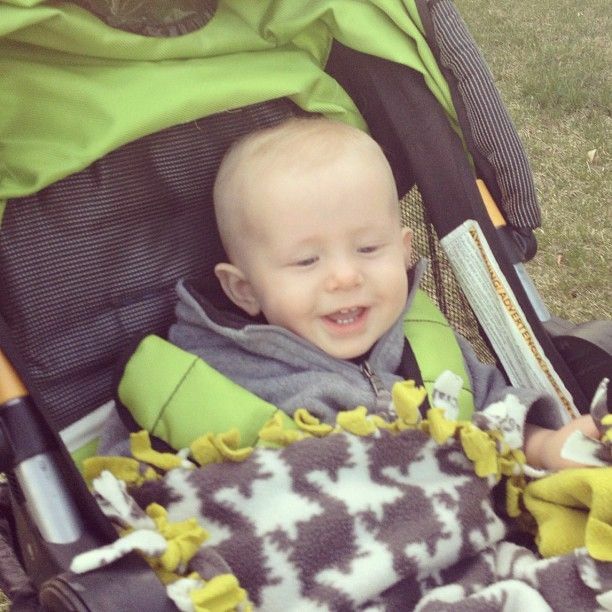 I hated running without a stroller, or hearing birds chirp. I hated the quiet time, which usually brought me to tears as I struggled to think about anything other than Preslee. My running quickly slowed down, and then I quit running all together. 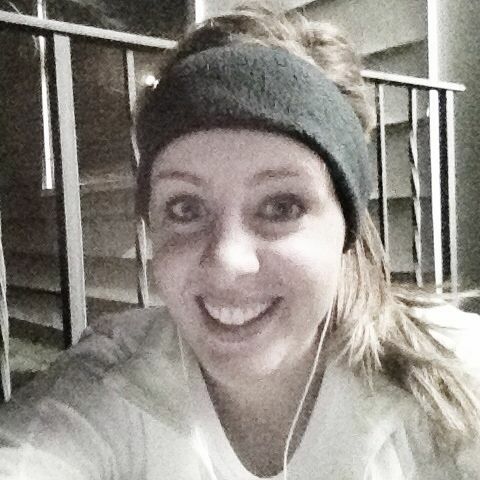 Looking back, I struggled with the sudden lack of exercise, which allowed depression to creep into my life. Then I was introduced to Zumba. (Thank you Amy) Zumba is incredibly social, and I had to concentrate on learning the new dances. I didn't have much time to dwell on Preslee. It became my way to escape my grief, even if it was just for an hour. "You learn to play the piano. You're surprised to find that want to play, that it's meaningful, even peaceful to play it. At first your songs are filled with pain, bitterness, even despair. But later you find your songs contain beauty, peace, a great capacity for love and compassion. You and grief--together--begin to compose hope. Who'da thought?" The bitter songs I'm playing are beginning to have a more hopeful tune at times. I now appreciate the quiet time I have as I run to think about everything in my life, and many of those thoughts contain Preslee. I still enjoy pushing a stroller, and am grateful for those "ledger notes," helping move my piano away from center stage as I hear Ledger squeal with delight as he watches the moving cars drive by. The picture on the right is the beginning of a huge meltdown because we stopped running. 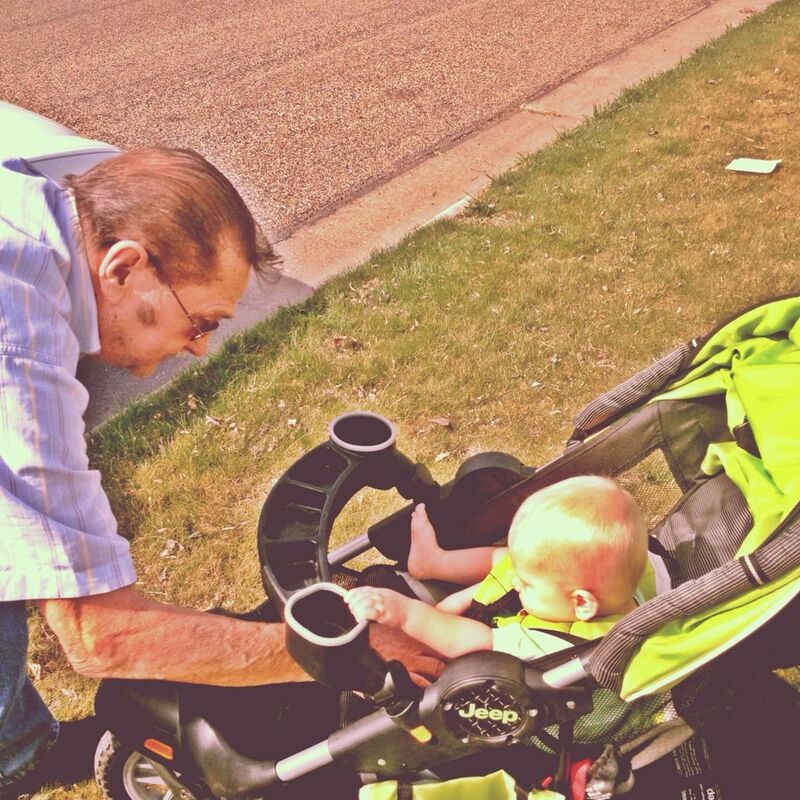 We ran into Great Grandpa Anderson on our run. And now Pat and I have decided to train for the Rexburg Rush sprint triathlon. I decided if I post it here, there's no backing out right? You can all hold us accountable in August. I'm looking for a double bike trailer/jogging stroller so I can start training on a bike. Any recommendations around $200? I have a double bike trailer. We got it at wal mart and i think schwinn makes it. I'm not sure, but it was under 100! I just had my in-laws pick one up from Costco for me. I will let you know how it is once I try it out. I am excited to get it. because I had sold two other strollers for that amount---so it just made more sense for me. Costco has a great one! We bought one a few years ago and are still using it! Love it! Ashley, I just started following your blog, and have been blessed by the perspective, wisdom and testimony that can only come from those personal and tender life experiences that are yours and that you so willingly sharing with others. I have wanted to comment for awhile now, and can't believe of all the posts I have smiled and cried through, I am commenting now, but I just had to let you know that I recently purchased exactly what you are looking for at Costco for $199, and love it! I remember reading on your blog the statement, "I can do hard things". As I look at your beautiful, blue-eyed Preslee, I think if you can say those words, this out-of-shape mommy of 5 can certainly get of the sidelines and RUN! Good for you. I am a runner as well and I find the times in my life when I was not doing it have been the hardest for me to deal with everything since I do not have that escape and that constant that means so much in my life. I just got one from costco that hooks to my bike and also is just a jogger stroller. It was just about exactly 200 dollars. I love it and it fits both my kids really well. I got a phil and teds on KSL for $250. I love it so much! I love running with my kids too and now my 3 year old will push her little stroller outside with her doll and say "I'm going running." Doing this with your kids will teach them to stay healthy and active. Good job. You are an inspiration. I love reading your blog. Have you ever thought of starting a Rigby? (isn't that where you live?) - anyway, a Rigby Classifieds on fbook? Someone started a Morgan Moms, down here in Morgan Utah, and then a Morgans Classified, and you can't believe that DEALS that get posted for either sale, or even for free... I know there have been several strollers like you are looking for posted for really cheap - just a thought. Maybe there is already one out there in your area, but it's GREAT. I used to look on KSL.com all of the time, but NO MORE ! We just got one from Costco, My Daughter loves it! it was right aroun the 200 mark, and is really smooth. Stroller: COSCTO. I just got one a few months ago. It's bright orange (which is cool) and it's super smooth. It looks like it can fit two kids easy, but of course Wyatt is the only one that sits in there for now. Rexburg Rush... that's awesome. I want to do some sort of dirty dash sometime. Can't wait to hear about it! Love you Sidder! Ok, maybe I am mis-reading the question.... why a DOUBLE jogger??????? OR do you mean a bike trailer that doubles as a jogging stroller? Costco is the best. I took mine out tonight. We went up into the mountains and it pushed like a dream. ok so this biker/jogger isnt $200 but its well worth the money. I have a chariot (www.chariotcarriers.com) and it has a bike arm, it has a jogging wheel, stroller wheels ,ski kit and hiking kit. I have the first 3 and use it all the time and its a dream to run and bike with. You can find great deals on used one on craigslist but we bought brand new and dont regret it at all. Seriously amazing baby transport systems. I have the Cheetah 2 (its a double, it can be a singe as well) but if I could go back and spend a few extra bucks Id do the cougar or the CX. GL! Ashley, I don't comment on your blog much, but I have been a reader for a long time. My daughter is very close to Preslee's age, born just 2 months after Pres. She too is blonde haired and blue eyed. And we call her our pistol. Thoughts of you and Preslee always come to my mind when she is being especially difficult. I know you would give anything to be enjoying the challenges this age brings. Congrats for running again. I like the saying that running never takes more than it gives. So very true. Funny story---I ran in high school (in PA!) with your Zumba coach Jodi!! It is a small world. Thank you for sharing your story, and your Preslee--it has made me a better mom. Ashley...I can relate to your post. I used to run with Kyla every day. I love working out it is one of my biggest passions. When we lost Kyla i also stopped workign out and running- i just couldnt do it without my little partner. It was so great when 2 years after her passing i starting running again. Now i love thinking of the great memories of her in the stroller and looking at my other kiddos in the stroller and realizing how blessed i am . I have a double stroller that i love. I researched them forever and have ran many many miles with my stroller. It is the INStep Safari Swivel Double Jogging Stroller . You can get it on AMAZON for about 169.00 delivered to your house for free. 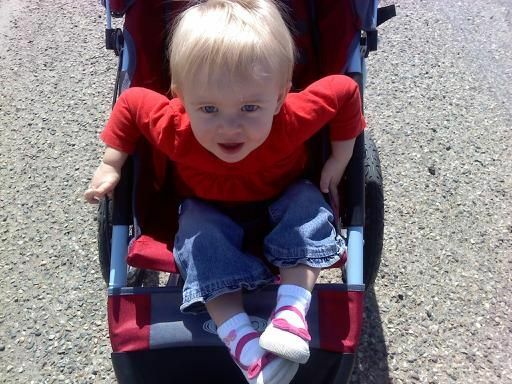 It is a great stroller alot like the BOB just cheaper. Glad you are doing well think about you often. So glad you are running again. I used to workout with Kyla everyday. We had a blast together running. When she passed away I stopped- I just couldnt do it without her by my side. About 2 years later i started running again. I love thinkging about her while i run and now looking at my other kiddos in the stroller and realing how blessed i am . I researched double jogging strollers forever . InStep Safari Swivel Double Jogging Stroller is awesome . it is around 169.00 on amazon and will ship to your house free. 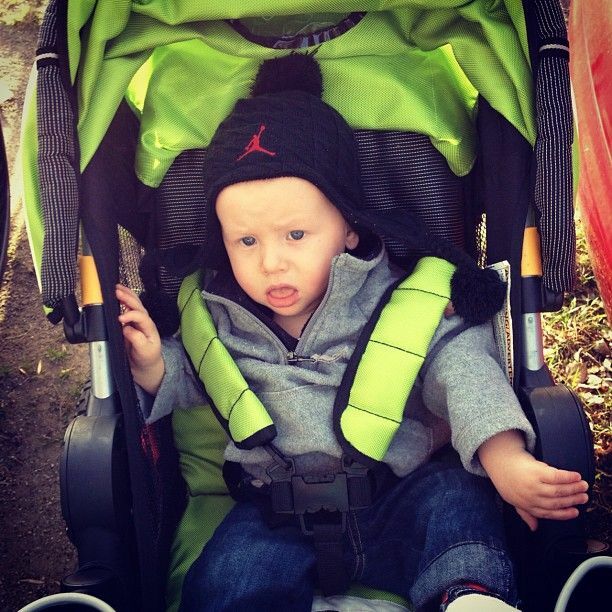 It is a great stroller runs alot like the BOB just alot cheaper. I have run many many miles with mine and never had a problem. Enjoy you running with your cute little man!!! I too was wondering about the "double" part of that sentence?! I have an instep (I think it is the rocket) double bike trailer/ jogger and I love it. Amazon had it for the best price. Love to jog with it and it works well with my bike. I have an instep ( I think it is the rocket) double bike trailer/jogger and I love it! I found it for a great price on amazon. I love to jog with it and it works great with my bike. I am in SLC and I am selling my bob jogging stroller for 200. I really love it but I don't run.